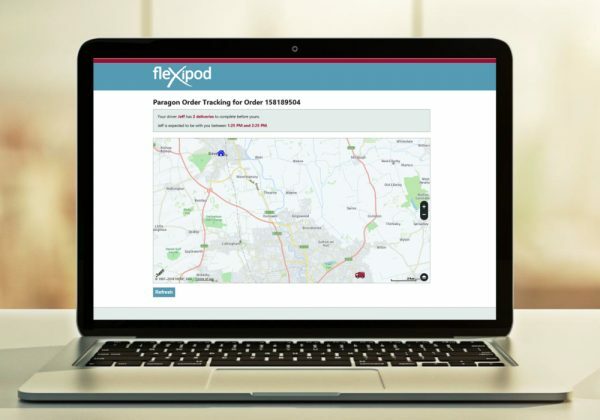 Dallas, TX – (April 11, 2019) – Paragon Software Systems has enhanced its fleXipod proof of delivery system with a map-based track my driver service. This functionality enables logistics operations to provide customers with access to live status updates on the progress of their deliveries. Logistics operations will benefit from improved first-time delivery success, increased customer confidence and reduced inbound customer-service call volumes. Logistics operators using Paragon’s proof of delivery software now have the option to upgrade the system to include, in both emails and SMS notifications, a link to the new driver tracking functionality. The interface can be branded and customized to provide a range of relevant information such as how many deliveries are left before an order arrives, providing customers with accurate information about arrival times so they can plan their day accordingly. Accurate communications ensure a higher proportion of customers are available at the time of delivery to accept an order, increasing first-time delivery success. Timely notifications also free up office-based resources by reducing the number of inbound calls from customers making “where is my order”, or WISMO, queries. In addition, customer service staff can be provided with access to the same tool, making it easier to resolve any complaints or queries.